A bear cub on Prince of Wales Island. This cub's forebears may have inhabited the island for 50,000 years. Bones from more than two dozen black bears dating from 4,000 to 50,000 years have been found in caves on POW. Ray Slayton photo. Southeast Alaska is home to some of the densest populations of bears in the world. But the distribution is peculiar – some islands have only brown bears, some only black bears, and some areas of the mainland have both. Biologists studying genetics and the relationships between different bear populations are developing a picture of how bears may have colonized the region and thrived after the ice age. Peacock and Kim Titus of the Alaska Department of Fish and Game looked at DNA from 289 black bears taken by hunters in Southeast Alaska – from the Yakutat area in the north to the Ketchikan area in the south, and from many of the islands that harbor black bears. They found nine genetically distinct clusters of black bears in the region. The black bears sampled from the Yakutat area were found to be very distinct from black bears in the rest of Southeast Alaska. That makes sense, as the country is mountainous and still heavily glaciated. “It would be a difficult passage for bears, so there’s not likely to be much mixing,” Peacock said. The other eight clusters are located on the Chilkat Peninsula, in the Skagway area, the Juneau area, the central mainland, Mitkof Island, Kupreanof Island, Kuiu Island, Prince of Wales Island, Revillagigado Island and the Southern mainland. The clusters that showed the highest divergence are Kuiu, Yakutat and Juneau. The Kuiu Island cluster of bears is separated from neighboring Kupreanof Island only by a very narrow ocean passage, Rocky Pass, but is still considered to be highly distinct. Peacock characterizes Kuiu as, “a major bear island.” “This is the highest density bear population in the world, and some say there used to be even more bears there,” she said. 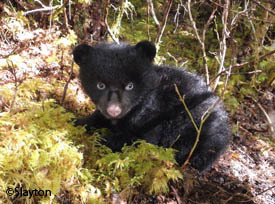 Prince of Wales Island includes the range of black bear genetic variation found throughout Southeast Alaska. That’s important – it implies the island might have been an early site of post-glacial colonization, or a source of modern Southeast black bears. Peacock’s work creates a picture of distinct bear populations, separated by mountains, glaciers and waterways. But where did these bears come from, how long have they been here, and how did they get here? Biologists and geologists studying the landscape, plants and animals are getting a fascinating look back in time at the history of this land and its animals. About two million years ago, black bears and brown bears diverged from a common ancestor. Shortly after that, black bears separated into the North American and Asiatic black bear lines – two different species. About 1.8 million years ago, North American black bears (and a number of other animals as well) were separated into two groups by the Cordilleran ice sheet spreading across the western edge of the continent. One group was isolated on the Pacific Coast, and perhaps, Peacock suggests, in glacial refugia in Southeast Alaska. The other group was widespread across the North American continent south of the ice sheets. As a result of this separation, over time American black bears diverged into two genetically distinct lineages, known as the coastal and continental lineages. At the height of the last ice age, about 18,000 years ago, the Cordilleran Ice sheet and associated glaciers covered Southeast and Southcentral Alaska. The coastline was much different than today, as the sea level was almost 300 feet lower. Interior Alaska was isolated from Southeast and Southcentral Alaska, but connected to Asia via the Bering Land Bridge, forming a vast open grassland known as Beringia. Beringia was populated with now-extinct short-faced bears, saber tooth cats, American lions, mastodons and mammoths, as well as surviving animals such as Dall sheep, brown bears, caribou, muskox, wolves and wolverines. But not black bears. Map showing the nine different genetic clusters of black bears in Southeast Alaska. The pink dots in the Yakutat area to the north appear similar to the red dots around Juneau. To the south, stretches of land along the coast also remained ice-free, and these refugia sheltered plants and animals. The glaciers help create the refugia, in one sense. The weight of the massive ice sheet depressed the land beneath it, but caused it to bulge upwards at the edge – the outer coast of southeast Alaska. The western edges of Baranof Island, Prince of Wales Island, Dall Island and Haida Gwaii (Canada’s Queen Charlotte Islands just to the south) were west of the continental ice sheet, well above sea level – and home to bears. Many of these islands were connected, and some refugia were exposed that are now submerged. “Black bears have always been here on the outer islands and survived in refugia. They were here pre-glacial and post glacial, 45,000 years ago and maybe way before that,” said geologist Jim Baichtel. Baichtel is the geologist for the Tongass National Forest, and he’s collaborated with a variety of scientists to put together a vivid, dynamic picture of Southeast Alaska over the past 18,000 years. Bones and fossils tell of the animals and where they lived; ancient pollen reveals the plants; rocks, volcanic ash and landforms indicate former coastlines and sea levels. Living animals also provide insights – cutthroat and Dolly Varden trout now in isolated mountain lakes that were once connected to the sea, or clues in chum salmon genetics that imply they, too, survived in refugia along the outer coast. The ringed seals and Arctic foxes are long gone from Southeast Alaska – and so are the caribou. “We had marmots on Prince of Wales before the ice age, but they didn’t make it through the ice age,” Baichtel said. He added that Prince of Wales is home to spruce grouse, quite unusual for Southeast Alaska, which elsewhere is home to sooty grouse. “That’s a remnant Pleistocene (ice age) population that got trapped,” he said. As the glaciers receded, animals now familiar to Southeast Alaskans found routes into the newly exposed landscape and colonized it. Some came from the south, some from the north, and some spread from the isolated coastal refugia that had harbored them. Wolverines came down from the north, and wolves and deer came up from the south. 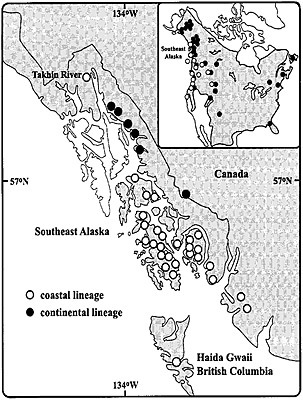 Black and brown bears were present in glacial refugia on the coast, and continental black bears also colonized Southeast and brown bears moved down from Beringia. The landscape was changing as well. The sea level rose as the glaciers melted, submerging coastal routes and refugia. In Southeast Alaska, the land also began to rebound and rise. As glaciers retreated and landscape was exposed, the major river corridors provided access from the mainland to the coast and into Southeast. A map showing the distribution of continental lineage and coastal lineage bears. 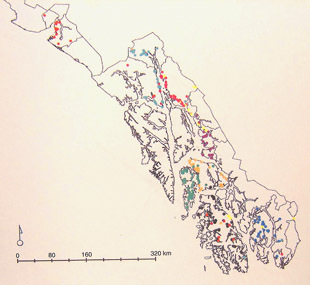 The continental bears along the central mainland area likely accessed Southeast via the Taku and Stikine river corridors. Coastal bear may have also taken those routes into British Columbia, eventually colonizing the Pacific Northwest. Bears didn’t just move into Southeast Alaska. Coastal bears moved out of refugia and into the Pacific Northwest and eventually, to northern California, the Cascades and part of the Rocky Mountains, mixing with the continental bears. Coastal bears remained in Southeast as continental bears moved in to recently deglaciated areas. Genetic evidence shows that bears along Icy Strait and the Chilkat Peninsula are descended from continental bears, which found access to areas that the coastal bears couldn’t reach. Southeast Alaska is a mix of ancient, resident black bears and more recent immigrants. As time passed, glaciers ebbed and surged, vegetation changed, sea levels rose and land rebounded. Geography affected all the black bears making Southeast islands and mainland their home, and nine clusters became genetically distinct. Black bears shared the ice-age coastal refugia with other animals, and likewise, other animals colonized Southeast after the glaciers retreated. It appears that marten, cat-like weasels, share a similar story with black bears. Southeast is home to the Pacific marten, a different species from the American marten found in neighboring British Columbia and elsewhere in North America. Like the continental black bears, American marten likely followed routes through the coastal mountains and colonized Southeast Alaska, joining the Pacific marten that were already present. And like the bears, their DNA shows their ancestry, and in some cases, hybridization between the two species. Another route plays an important role in the story of Alaska’s black bears, which are new arrivals to Interior Alaska. As the massive North American ice sheets receded, a corridor opened between them, creating a route just east of the continental divide from the Lower 48 to Interior Alaska (Beringia) through what is now Alberta and the Yukon. Biologists have proposed that the ancestors of modern bison, which came to Beringia from Asia, took this route south to colonize the Lower 48, and black bears took this route north to Interior Alaska. Stephen MacDonald and Joseph Cook, in “Recent Mammals of Alaska,” write that fossils of black bear have not been found in central (Interior) Alaska, and the bears may be a recent southern immigrant. Possible black bear remains have been found in a cave on the Porcupine River, dated at about 8,000 years before present. That cave is situated at the northern end of the route to Alaska. According to Joseph Cook, other species, from American marten to shrews, show a similar pattern of colonization of Interior Alaska as well. The study of black bear distribution may also provide insights into the movement of people. The coastal and interior routes likely opened and closed during the ice age as glaciers surged and receded, before finally opening completely, and humans were among the many animals that used those routes.